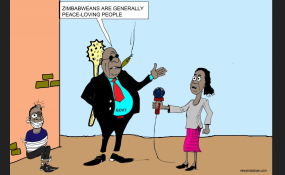 Human rights abuses in Zimbabwe cartoon. Cape Town — allAfrica editor's note: The author of this blog post is anonymous because of fear of reprisals. The writer visited Zimbabwe in the past 12 months. Here, I am back in my birth country for a few days. I'm excited to see my people, their friendly smiles, their excitement for a new Zimbabwe. But damn, I was so wrong. Instead of the smiley faces I expected, I was greeted with people who seem to have lost all hope. Who don't know what the future holds for them. A people frustrated because they have no jobs and no visible way to improve their lives. Will my people ever get a breather? Once upon a time, my country was one of the most developed nations in Africa, with an envied infrastructure and education system. It was a country blessed with abundant mineral resources, well-educated people and regarded as Africa's bread basket. But, now the economy is deteriorating and in heavy debt with no sign of recovering. I remember vividly growing up in Harare, at that time, a city made of milk and honey. Our Zim dollars had value. There were no queues of any sort. The education system was top-notch. Corruption, what corruption? Almost 90% was of the population was employed. No one even thought about emigrating. We used to have pride walking down the streets of the city centre, wearing our best gear. Everyone was respectful of each other. No street hustlers or vendors. Roads perfectly tarred, no potholes. The town was so beautiful and clean, like it was made of gold. Then, all of a sudden things started changing. We were young but you could tell that something was wrong. The cost of living became high. You could cut the tension in the house when it was end of month as bills became harder and harder for our parents to pay. As a teen, you really didn't care much as long as you had food to eat and a place to sleep. It's just a phase, we thought. Little did we know ... this was just a beginning of the worst days to come. Land reforms started and there was a lot of bloodshed. Black farmers started taking land from white farmers. But, with little experience, the new farmers struggled to produce food, and there was a large fall in food production. Our economic problems have been long in the making as Zimbabwe was already placed under sanctions. Prices began to spiral out of control as the Zimbabwe dollar plunged in value, leading to further economic decline. Just driving down the streets of Harare, you could tell all seemed to be falling apart. The roads are rutted, narrow and full of potholes. The struggle is real as people's stories tell of hardship, deepening poverty and unemployment. The youths standing on corners, confronting their demons with drug use. Communities are falling apart. Children suffering. Life has become survival of the fittest. Hope is lost. I thought a new dawn had come in November 2017, after a coup (not a coup) unfolded and/or former president Robert Mugabe resigned from power after 38 years of an oppressive regime. Mugabe's dictatorship era had ended. But what changed? The once-proud people are now reduced to hawkers and black market hustlers, yearning to just earn just enough for a meal. It is sad to hear people call for uncle Bob to return to power. Many say everything seems to be much worse now. How can a country that was looking for prosperity, just became the worst. That's a sad feeling shared by many. Is it bad governance, mediocre leadership or just greedy people running the country? Is a new start even possible? We heard that there are many opportunities in Zimbabwe and it is open for business. President Emmerson Mnangagwa promised a revived economy when he took over from Mugabe. When Mnangagwa came to power, there was hope. But the reality is quite different. Fear and frustration. Those who are still able to leave the country are moving - but for many, the economy has turned into a nightmare. The rich keep getting richer and the poor, poorer. People are dying from a lack of medicines. Many motorists miss the comfort of their beds because they sleep in queues hoping to get fuel. The queues can be seen stretching for kilometres. You hear a lot of chattering or loud music from their cars as they wait for their turn at the fuel pump. Sometimes queues build up merely on the off-chance that fuel may arrive. The motorists often wait for hours or days. You can see panic in some faces. The situations becomes dire when there is fuel shortages which leads to shop owners doubling up their prices and, chaos usually follows. Many will resort to panic buying and hoarding as they fear a repeat of 2008 when hyperinflation wiped out savings and caused chronic shortages of food, fuel and cash. Many people have little trust using bond notes as a currency especially when the U.S. dollar is scarce. I got the shock of my life when I wanted to buy a burger, mind you it didn't come with fries or a cool drink, and the bill came to U.S.$18 (R252). What the hell? An ordinary citizen is living as a pauper. What the country needs now is a revamp. I couldn't believe it when I saw many people queuing to withdraw money at ATMs. Even after standing for long, some went away empty-handed. The government strictly limits the amount people can withdraw. Where is our Moses who is going to take us to the promised land, a land of milk and honey? My people are crying and it seems like their prayers are not being answered. It's such a sad scene to see young children hustling instead of going to school. What does their future hold? Many people have left from the cities to live in the rural areas, and live off the land due to difficulties in affording the expensive city stores. Rural life is cheaper and many have the advantage of being able to produce their own food. Sadly, most have reverted to the bartering days, where one can do a day's piece job for something, usually food, in return. Locals testimonies all speak of no hope. One man talked about having to move his family from Harare, just because he had lost his job and couldn't afford to pay rent. This particular man, has a degree but "nowadays a degree its just a piece of paper". He says, "he is forced to do meagre jobs and his older children have already jumped borders to work in neighbouring countries". Many children are now seen at bus stops, wearing clothes that are oversized, old and tattered, selling anything from fruits, roasted corn or ishwa, a termite delicacy. The profits are small but this is the only way they can help their families to survive. Those who have children or relatives who live outside of the country, sometimes have it easier when they receive money. But money won't last because of the inflation. Most have nothing. It was just a matter of time before all hell broke loose.